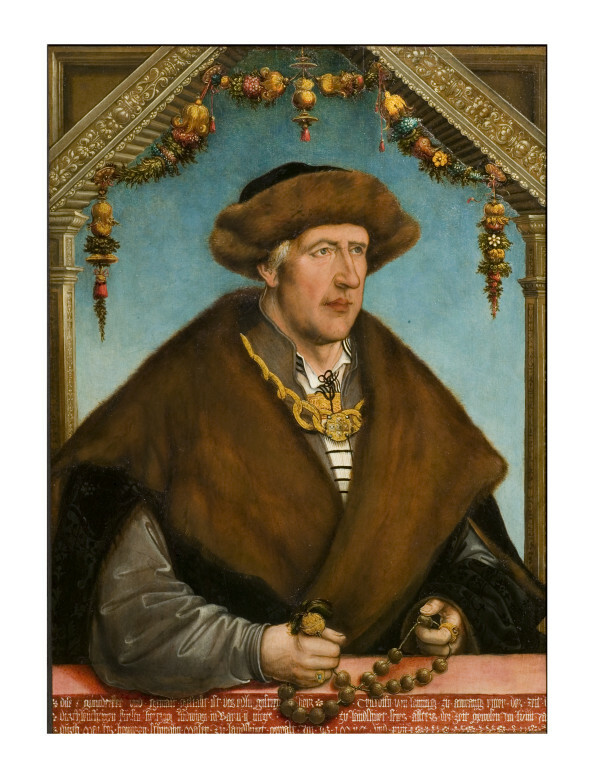 In this three quarter length portrait the sitter appears beneath a decorated arch, holding a rosary, with one arm resting on a ledge, which is inscribed with a German inscription identifying the sitter and artist, and providing its date of 1517. Christoph von Laiming of Amerang (ca.1460-1520) was a member of one of the oldest noble families in Bavaria. He was the principle servant, and master of the household, of Duke Ludwig X of Wittelsbach (1495-1545), Viscount of Landshut, a younger brother of the Duke of Bavaria. This is a fine and characteristic example of Wertinger's portraits of members of the Court at Landshut. Ludwig X made this provincial Bavarian city an important centre of Renaissance culture. Von Laiming is prestigiously dressed, in a fur cape and hat, with a heavy gold chain. The painter Wertinger himself received a robe when he was appointed a court painter in 1518. This portrait embodies the ambition of the recently founded court of Landshut, and the status of its principal courtier. Oil on spruce panel, portrait format. 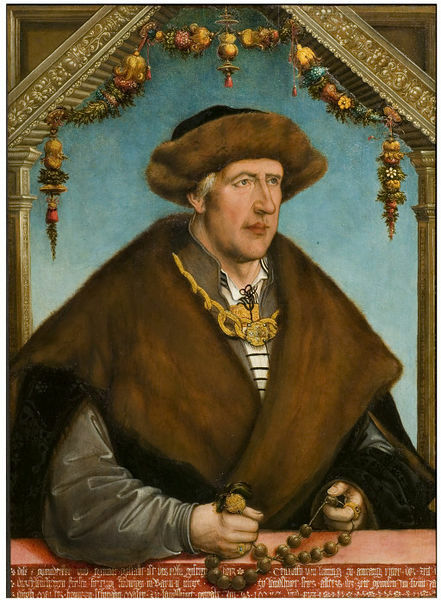 Portrait of a man facing our right, wearing a fur cape and a fur hat, and holding (probably) a rosary. His right arm rests on a ledge on which the inscription is written. He sits beneath an arch painted with decorative motifs and hung with floral swags. This portrait and painted image of the noble and gracious Herr Christatt von Laiming, of the rank of knight, during the reign of his majesty Prince and Duke Ludwig of Bavaria, Viscount of Landshut, in former times, in his 59th year, was painted by Master Hans of Swabia, painter of Landshut, in the year 1517. Inscribed on the ledge on which the sitter is leaning. Hans Schwab, or Wertinger (ca. 1465/70-1533) became a citizen of Landshut in 1491, was patronised by the Bishop of Freising from 1497, and designed stained glass windows in Straubing and Landshut. Most of his surviving paintings and woodcuts date from 1515 or later, and in 1518 he was installed as a court painter at Landshut. This half-length image, with the sitter holding a rosary within an architectural surround decorated with swags is a characteristic example of his portraiture. It may be compared, for example, with Wertinger’s portrait of Duke Ludwig X of Bavaria (1516; Munich, Bayerisches Nationalmuseum) and other half-length portraits of Bavarian nobles by the same artist. Wilhelm IV of Wittelsbach (1493-1550) succeeded as Duke of Bavaria in 1508. In 1516 his younger brother Ludwig X (1495-1545) also received the title of Duke and possession of one third of the duchy, including the Lower Bavarian towns and tax-collecting districts of Straubing and Landshut, where he established his court. Wilhelm IV and Ludwig X were first cousins of the Marquis of Mantua, Francesco Gonzaga, husband of Isabella d’Este. Ludwig made Landshut a centre of Renaissance culture, erecting in 1536-43 a city palace inspired by the Palazzo del Te. Christoph von Laiming of Amerang (1460-ca.1520) was a member of one of the oldest Bavarian noble families, and had previously served Ludwig’s father Albrecht IV as steward of Burghausen and deputy of Bavaria at Landshut. He was Ludwig’s principal servant, holding the titles of deputy of Lower Bavaria and master of the household. A full-length figure of Von Laiming, identifiable by comparison with 768.1-1865, appears in the foreground of Wertinger’s painting of Alexander the Great and his Doctor Philip, also dated 1517, which is now in Prague. This depicts an episode from Curtius Rufus’ History of Alexander the Great, which had recently been translated by the Bavarian court humanist Dietrich von Pleningen. One of the earliest German Renaissance paintings of a subject from classical history, this is represented as a contemporary event at the Landshut court, with portraits of William IV and Ludwig X in the background, the latter based upon Wertinger’s half-length portrait of the duke, painted the previous year and now in Munich. 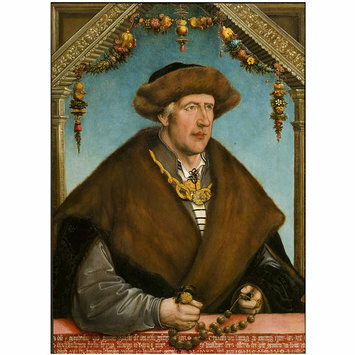 The rosary with large beads held by Von Laiming, and the decorative framing elements and swags above his head appear in earlier portraits by Wertinger, such as that of Prince-Bishop Philipp of Freising, dated 1515 and also in Munich. Von Laiming is prestigiously dressed: over a fine shirt, he wears a doublet with a decorated (perhaps embroidered) insert, visible in the deep v-neck, laced over his breast. Over this he wears a coat with a broad fur collar and vertical cuts to admit the full sleeves of his doublet. Other signs of his social rank are the heavy gold chain worn round his neck, his rings, and the broad fur brim of his cap. Ludwig’s deputy and master of his household appears as richly dressed as the duke himself, whom Wertinger depicted wearing a similar coat with fur collar, a single chain round his neck, a doublet with much fuller, heavily-slashed sleeves, but only a single finger-ring, no rosary, and a cap without fur trimming. Wertinger himself received a court robe when he was appointed as a court painter in 1518. This portrait seems to embody the ambition of the recently-founded ducal court at Landshut, as well as the status of its principal servant. Albrecht Dürer succinctly characterised the main aim of portraiture: ‘It preserves also the likenesses of men after their death’. One of the earliest surviving autonomous painted portraits, of Archduke Rudolph IV of Austria, datable around 1360-5, probably had a memorial function. In Germany, by the sixteenth century, independent portraits of nobles, patricians, and middle class sitters were quite numerous. They sometimes bear supplementary information, including the date of execution, the age of the sitters, and sometimes their names and/or coats of arms. Following Dürer’s example, many South German painters adopted the practice of signing their work. Portraits could be commissioned to commemorate special occasions, such as weddings, exchanged with friends or associates, deployed for special purposes, such as in marriage negotiations, or displayed to advertise ties of kinship or allegiance. Series of portraits were sometimes commissioned of members of a family or corporation. Such works often adhere to a standardised compositional formula, and frequently depict their subjects wearing a comparatively narrow range of costume. The right to wear expensive fabrics, furs and jewellery, was sometimes limited by sumptuary laws, or princely command. Oil on spruce panel, portrait of a man facing to his left, wearing a fur cape and a fur hat. Kauffmann, C.M. Catalogue of Foreign Paintings, I. Before 1800. London: Victoria and Albert Museum, 1973, pp. 300-301, cat. no. 376. Georg Spitzlberger, ‘Hof und Hofstaat Ludwigs X im Zwielicht der Überlieferung’, in Iris Lauterbach, Klaus Endemann and Christoph Luitpold Frommel (ed. ), Die Landshuter Stadtresidenz: Architektur und Ausstattung, Munich 1998, pp.17-19.